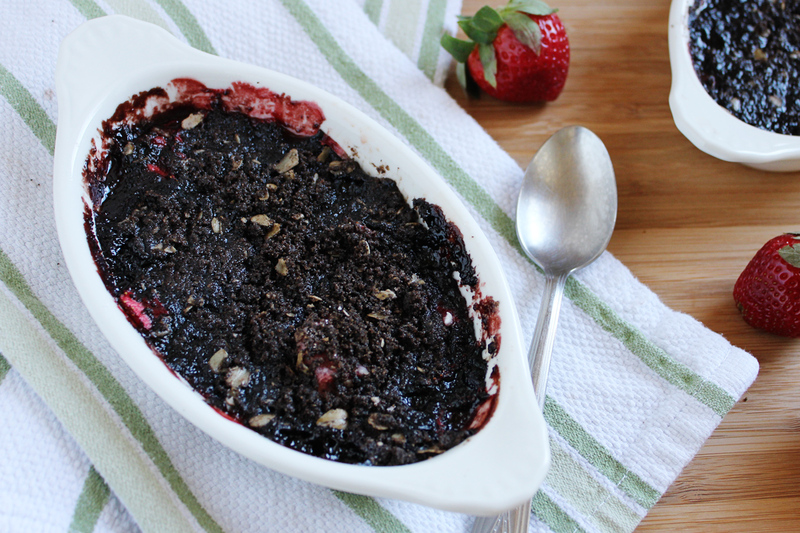 Rich chocolate topping over fresh strawberries make this decadent Strawberry Brownie Crumble a must try for the true brownie lover! The title of this recipe may leave you wondering, what? or maybe you’re intrigued or perhaps even thinking about chocolate covered strawberries? Man do I love me some chocolate covered strawberries! But what girl doesn’t right? There is a candy company in Jacksonville, FL called Peterbrooke Chocolatier and they make some truly amazing confections, one of which is chocolate covered strawberries. Yesterday I had a brownie craving at 8 in the morning, you know those days when the urge hits way too early? Well this got me thinking about how to satisfy said urge and after a trip to the gym and the grocery store I turned to my trust brownie cook book. If you haven’t read one of the posts I have done about brownies since last October, than you need to check out Brownie Points by Lisa Slater. I was thumbing through the book and a recipe for crumble topping caught my eye; at this point I started questioning what I was reading and trying to decide if strawberries baked with brownie crumble would taste good or not? Obviously my instincts told my mind to stop being crazy and start mixing. Fresh strawberries tossed in lemon juice and sugar and covered with a deliciously, rich chocolate topping makes for a decadent dessert any brownie lover must try. You can substitute the fruit for another of your choice, especially depending on the season; I can’t wait to try this with cherries. Whether you serve it alone or with ice cream, I hope you’ll enjoy; happy baking! Preheat your oven to 350º and prepare an 8"x8" baking pan with cooking spray, set aside. Slice the strawberries and toss them together in a bowl with the sugar, corn starch and lemon juice; spread over the bottom of the baking pan. In a separate bowl stir together the topping ingredients, until a crumbly soil-like texture is achieved. Sprinkle the topping over the strawberries and bake for 20-22 minutes, until bubbly. Remove carefully, cool 8-10 minutes and serve warm. Oh wow that sounds absolutely DELICIOUS!!!! Oh thanks for pointing that out, I’ve updated the ingredients… how on earth I missed that I will never know? This sounds wonderful. Thanks for sharing on Foodie Friends Friday and hope to see you again next week. Strawberries with a brownie crumble topping? Girl you are a dessert genius! What a fantastic combo together!!! Oh my god this sounds INCREDIBLE! Strawberries and chocolate are the best things ever.. how did I not think of this?! Pinning immediately. I don’t think you can get corn starch in the UK – any idea what I could use as an alternative? Thanks!